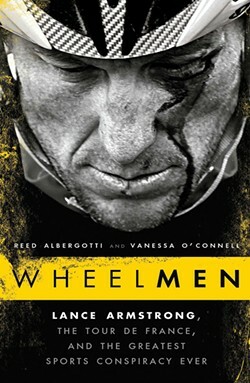 Lance Armstrong's Legacy Revealed in "Wheelmen"
Lance Armstrong inspired millions by winning seven consecutive Tours de France after conquering cancer, then shocked the world by revealing it was all a lie. After years of dodging doping allegations, Armstrong finally admitted last January that every single one of his Tour de France victories was tainted. But exactly how Armstrong was able to get away with it for so long has remained a mystery—until now. In 2010, Wall Street Journal reporters Reed Albergotti and Vanessa O’Connell uncovered an explosive series of e-mails that Armstrong’s disgraced former teammate Floyd Landis sent to high-ranking cycling officials, revealing the machinations behind the US Postal Service Team’s success. Now, after three years of research and hundreds of interviews, Albergotti and O’Connell reveal the truth behind Armstrong’s achievements in Wheelmen: Lance Armstrong, the Tour de France, and the Greatest Sports Conspiracy Ever. A few days after Wheelmen was published, O’Connell spoke to Chronogram over the phone about why she and Albergotti wrote the book and how it could help the troubled sport of cycling—not to mention Armstrong himself—finally turn the corner. Vanessa O’Connell will be appearing at Oblong Books in Rhinebeck on Friday, November 8 at 7 pm to discuss Wheelmen. (845) 876-0500; Oblongbooks.com. Wheelmen almost reads like a spy thriller in places with its undercover agents, sophisticated drug smuggling rings and conspiracies that go all the way to the top. When you first began reporting on the story did you have any idea how deep this thing would go? Not at first. One of the interesting things that we concluded in writing the book is that Armstrong almost got away with it! Going back to 2010, 2011, even early 2012, people still believed that he had been falsely accused of doping and that he was telling the truth. So we weren’t 100 percent sure where it was headed. Once we verified that Landis was telling the truth, and that there were others who were able to stand behind what he said, we knew that eventually the secret would come out. When Landis sent those e-mails there was already a criminal investigation underway. But it was into the Rock Racing team, a completely different team. Then all of a sudden the federal investigators turn their attention to Landis, he becomes their chief witness, and Armstrong becomes a target. It was just a matter of coincidence more or less that really brought Armstrong down. If Armstrong hadn’t come back again to cycling for the 2009-2010 season and if he had been just a little bit nicer to Floyd Landis, who was down in the dumps, maybe Landis never would have sent those e-mails. Out of all the things you uncovered while working on the book, what surprised you the most? A couple of things. First of all the theme I mentioned before: [Armstrong] really almost got away with it. Another thing we found surprising was the extent to which Armstrong’s sponsors supported him in every denial. He had full support from all of his sponsors throughout every denial. That gave his lie a lot of momentum, and helped him maintain the support of the public. Finally, looking back on Armstrong’s character, going all the way back to his teenage years, we saw that he was always tinged with selfishness and anger. We realized that it was pretty consistent throughout his private life. Most people only know the public persona of Lance Armstrong. Very few people know the private Lance Armstrong, and we discovered that in some ways doping seems very much in character for him. How much of Armstrong’s character is to blame for his own downfall? I think that if he had shown true remorse, apologized, and admitted he had doped earlier on, people would have forgiven him. We’ve yet to see how he might crawl his way out of this, because now he’s not able to compete. Unlike Tiger Woods, who’s allowed to play golf, Armstrong can’t compete in an elite level sport because he’s been banned for life. So his rehabilitation has got to be based on his personality alone, and that’s going to be very tough. If he had played his cards a little differently and asked for forgiveness, he probably would have gotten it from the public. Where does the sport of cycling need to go from here to regain people’s trust, especially those who have turned their backs on the sport in the wake of these consistent doping scandals? I think there is a lot of attention being paid right now to the problem. There’s been a change in leadership in the International Cycling Union, the federation that oversees the sport on a global basis, and that’s a step right there in the right direction. But for the sport to heal I do think Armstrong needs to step forward and provide more details than he has so far. Reed and I wrote the book as a way to fill in some of those gaps that Armstrong left. He’s acknowledged doping but he didn’t really fill in the important details. That left people wondering how he was able to get away with it all, and that’s really what drove us to write the book. We wanted to explain to the public what really happened. But until Armstrong steps forward and articulates how he was able to dope, and cover it up for so long, I think people will still be suspicious. I do think the sport will turn the corner and it has already come a long way. The sport does have a very long future but it certainly feels like it’s in a bad place right now. Do you think that if Armstrong reads the book it might propel him to finally take that step forward? Absolutely. There are two steps to it: First, it all has to get out there. All the secrets have to be exposed. Armstrong’s secrets and the secrets of those who supported him in his lies as well. And then Armstrong has to come clean about how he was able to dope. Although we explain most of that in the book, people need to hear it from him if he wants to be forgiven. He would do the sport a big favor by sitting down and telling the whole truth. But in the meantime hopefully people can read our book and get a better idea of what really went down. Lance Armstrong confesses the use of performance enhancement drugs to Oprah.